The story at first is about comic creator Kevin Yamagata, former Army translator and second generation Japanese-American, is shocked when he’s told his comic Billy Bat resembles a manga he may have seen in Japan. He heads overseas to meet the maker of the comic and apologize. 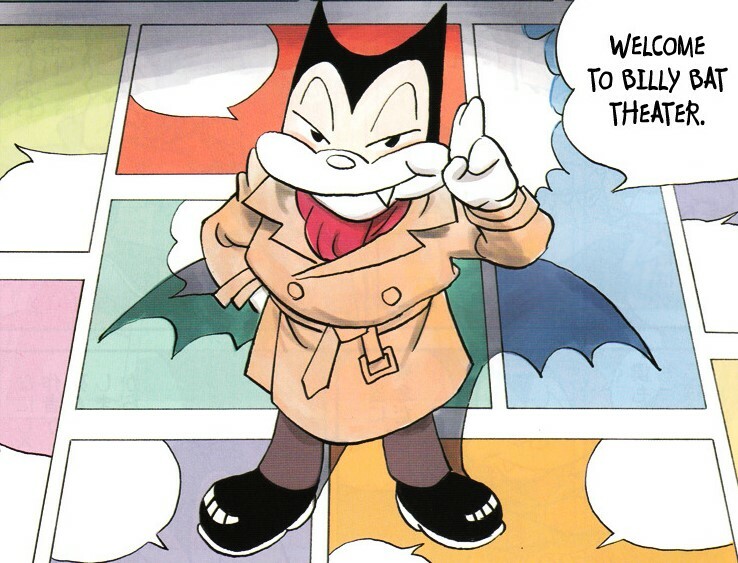 It doesn’t take long for him to be caught up in the post-WW2 politics of Japan and even less to be caught in a much larger mystery that reveals that the Billy Bat character is in fact centuries old and extremely powerful. 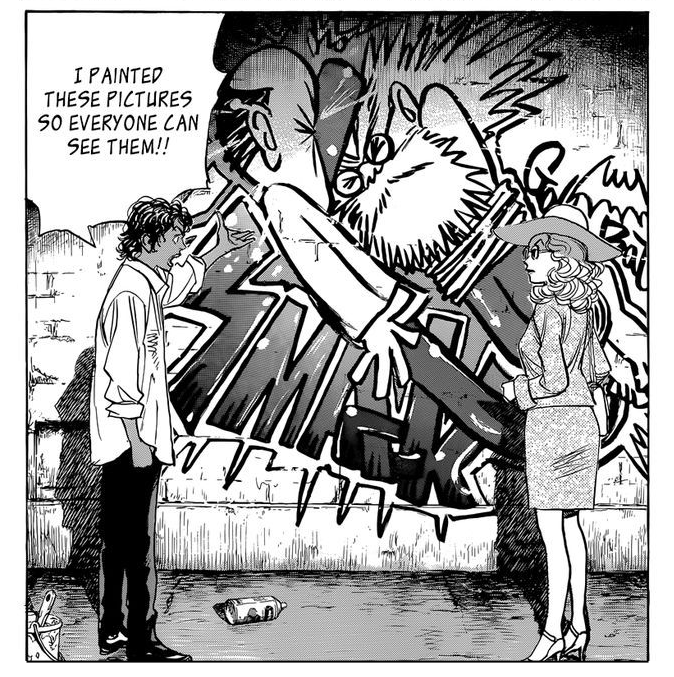 As the manga goes through it’s over 160 chapters this set up expands to feature a multitude of characters, both fictional and historic, and to slowly reveal it’s themes. Even without Kevin being there Billy Bat grows to larger heights in a clear satire of Walt Disney and his empire. Seeking to control its central sanitized character it employs government officials and assassins to make sure that their Billy Bat is the only one left in the world. This is obviously parody of Disney’s noted protection of Micky Mouse but the manga does not have to stretch reality far in that respect. Another plot has a soda company that slowly amasses more and more of the world’s water supply, which is not an exaggeration as we look on as Nestlé buys more and more water reserves to sell. In the face of this capitalist hellscape that so closely mirrors our own the most ridiculous part of this is the idea that anyone would care about a small comic starring a cartoon bat. However we as humans require art and so that is truly what the comic is about. Sure there are mysteries and reveals and a physical version of Billy Bat that only a select few can from see or hear but all that is driving the central point home. That in the face of the world that always seems to be on the brink of falling what is the point of art and what is the role of the artist. Kevin Yamagata is told early on by the apparition of Billy that he is destined to do great things. It tells that to just about everyone it talks to. One particular character just wants to be remembered forever, no matter what it is for. The idea of being remembered in the pages of history is what has driven people to commit horrible deeds alongside the good ones. Billy Bat puts forward that being remembered by one person for a good deed is far more important. As it progresses through time from ancient Japan to the not so distant future of America we see how these small acts of kindness pass from person to person and ultimately end up on the pages of Billy Bat where it goes on to inspire more people. Art will not save us as we look upon the world’s descent into fascism. No parody or satire will defeat them. Art can just as easily be co-opted by the fascists as seen when a character draws Billy in full Nazi regalia to amuse his neo-nazi friends. It’s not just surface level mocking of the Disney corporation and their controlling nature, it is directly showing how the artistic intent of a single man gets twisted by the forces of capitalism and fascism, two arms of the same body. Lots of the talk in the comic is made towards what makes a “real” Billy Bat. In the fiction of the comic this means the person wrote the comic as inspired by the spirit of Billy himself. In reality this is much less fantastic. The defining thing that combines the real artist is that they write not for money but to pass forward something to another person. It might be that hope for a better world but it can be as simple as a joke they laugh at. Near the end of the comic everyone begins to lose any ability to see past the present. The future has become too changed by the actions of the characters, nothing is going as it should. In the end they are thrust out into the world with no safety net. This is ultimately freeing though. With the realization that the future is not set in stone they realize just how much the impact they can make is, no matter how seemingly small it is. That their art will not save the world as they thought but that it will save some of the people within.